Senior Chakecia Miller dribbles past the Maryland defense. 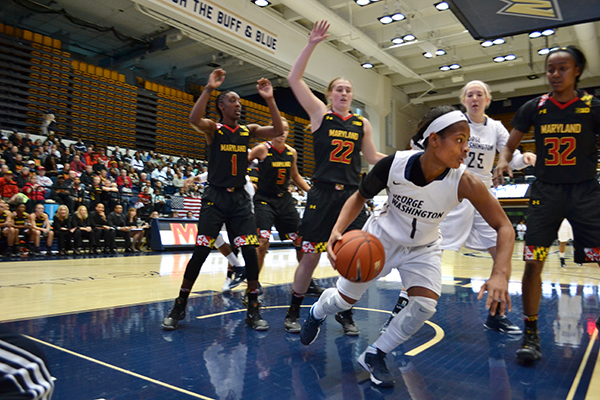 The Colonials fell to the Terrapins 65-75 at the Smith Center on Saturday. GW proved that it could contend with the top teams in the nation in the 75-65 loss, though persistent turnover troubles prevented the Colonials from getting anywhere beyond the “almost” stage and turning a first-half lead into an upset. Coming back onto the court after sitting out since the exhibition game against Virginia Union, Jones made an impact, leading GW with 18 points and reaching a double-double with 10 rebounds. Trailing closely behind Jones, sophomore forward Caira Washington amassed 10 rebounds, and sophomore guard Hannah Schaible had five. In the first half, the Colonials’ frontcourt was able to compete against their nationally ranked Big Ten opponent, helping GW secure a 30-29 halftime lead. But backcourt and transition play was dominated by a faster Maryland team in the second half. Maryland obtained 17 points off turnovers in the second frame, as slippery hands coughed up the ball. GW is currently averaging 20.5 turnovers per game, and holds the third-highest turnover margin in the Atlantic 10. Tsipis also thought his players became “stagnant in the zone,” standing around waiting to react to Maryland’s scoring possessions. Maryland’s skill and speed also forced the Colonials to foul. Overall, GW notched 22 personal fouls, allowing the Terps to capitalize at the keyhole on 14 of their 22 opportunities in the second. Maryland only forfeited a total of 15 personal fouls as GW struggled at the line, going 44.4 percent on the night. “We need to get a better understanding of freedom of movement in women’s basketball. We can’t put hands on people and get them in to that early one-on-one situation,” Tsipis said. Maryland’s guards were also more proactive in the second half, creating options to shoot threes from the perimeter or dish to the posts to get easy points off the glass, while the Colonials struggled to keep the Terps out of sync on transitions. GW has the opportunity to build some confidence at home against Grambling State on Monday at noon. The Tigers were 11-20 last season, when they had a -3.7 turnover margin. And Tsipis said the team will work on playing clean heading into the next game. “We’ve got to be better rotation-wise, and I think we are still building that part,” he said.